For many, a refreshing dip in the pool is a welcome rite of summer. With this “rite” come swimmer responsibilities. To mark this year’s Healthy and Safe Swimming Week1, we explore the topic of swimmer hygiene. Warning: this discussion is somewhat graphic, but it is meant only to encourage healthy swimming. Healthy swimming requires healthy pools. It is the pool manager’s responsibility to maintain proper pool chemistry, including appropriate pH and chlorine levels. But did you know that swimmers can affect pool chemistry just by entering the pool? You may ask: Doesn’t chlorine control the germs in pools? Why be concerned? Chlorine-based disinfectants do destroy most waterborne pathogens. Impurities introduced by unhygienic practices deplete chlorine, however, leaving everyone at greater risk for infection if chlorine levels are not carefully maintained. Swimmers can help keep pool water safer for everyone by showering before swimming and not peeing in the pool. Additionally, anyone experiencing diarrhea should stay out of the pool, and swimmers should avoid swallowing pool water. As CDC notes, just one mouthful of “germy water” is enough to sicken some people. You can keep tabs on pool water chemistry by using pool test kits to monitor the pH and chlorine level. Every summer, the Water Quality & Health Council makes these kits freely available to the public (one to each household) at www.healthypools.org. The kit includes color-coded test strips for dipping into pool water and instructions for interpreting the results. If readings for the public pool you visit are off, see the pool manager and don’t swim until levels are corrected. If levels are not satisfactorily corrected, contact the local public health department, as they have the authority to regulate public pools. Backyard and community pools bring friends and family together in one of the few remaining environments in which smart phones and tablets are not a major distraction—a refreshing thought! Armed with a greater awareness of swimmer hygiene issues, we hope your pool experience will be refreshingly healthy. 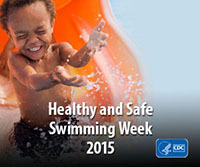 1Healthy and Safe Swimming Week is May 18-24, 2015, and is sponsored by the US Centers for Disease Control and Prevention.